Providing you the best range of clamp meters with effective & timely delivery. We are engaged in dealing and stocking Tong Tester Clamp Meters. These electrical testers are equipped with Volta meters and AC clamp meter. Moreover, the components are used for checking the flow of electricity current in a conductor. We provide the delivery of these clamp meters at industry leading prices. 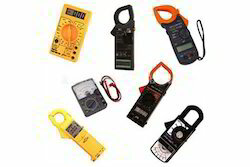 Looking for Clamp Meters ?